Chad Smith's Holy Chinas have fulfilled his original brief and excel in '11 and over' situations. Playing one will leave you at risk of uttering a Holy 'pardon?' for days afterwards. Incredibly loud. Optional brilliant finish. Smaller holes for more volume. The drilled holes in the Holy Chinas further add to the levels of volume and attack. Polished or natural finishes are available of the B20 Bronze alloy cymbals. Chad Smith helped design the Holy Chinas while JoJo Mayer worked on a new OMNI crash rider type of cymbal at the same time. Chad Smith needs little by way of introduction to drummers. Sabian has harnessed the Red Hot Chilli Peppers' drummer's brilliance and originality to develop two innovative new Chinese cymbals. "A tap of a stick results in a shiver of electric intensity; a full-blooded hit practically illuminates the room." 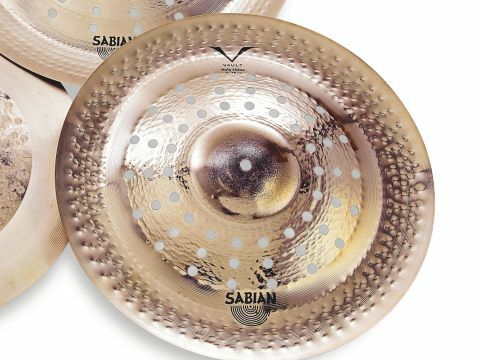 Chad Smith simply wanted the loudest, baddest china that Sabian could make. Taking design elements from the X-Treme and O-Zone models, the Holy Chinas seem to have answered Chad's prayers. Fittingly, Holy Chinas have Sabian's exalted Vault status. Available in 19" and 21" diameters and cast from B20 bronze, both models have raw bells, high profiles and wide lips. Between the bell and lip, each cymbal is dotted with holes (around 13mm in diameter) - there are 51 in the 19" and 64 in the 21". Unlike O-Zone cymbals, where large holes create complexity and tonal distortion, the smaller holes here increase the attack and volume to Chad Smith levels. With their blinding finish and numerous perforations, the Holy Chinas have an aura of menace about them. The looks don't deceive, and while note-wise the cymbals are authentically trashy and china-like, the degree of volume and aggression contained within them is almost off the scale. Ear-shredding levels of attack mean that they don't so much slice through the mix as blast a hole in it. A tap of a stick results in a shiver of electric intensity; a full-blooded hit practically illuminates the room. The 19" model is quicker and sharper-sounding, while the 21" is the equivalent of a cymbal wipeout. The Holy Chinas showcase Sabian's creative and technical expertise.